Biffy Juice is the the waste that seeps through the dirt when campers flush too much. MWL stands for Much Woodsey Love, and is how volunteers sign off on their emails. Wench was someone assigned to campers/staff during chores or other things they didn’t know about (especially doing dish duty long ago). They often led skits and taught camp songs during campfires and were very experienced in camp and the ways of camp. Classic Camp is the traditional program at UniCamp, Classic Camp provides traditional summer activities and outcome based programming to campers ages 10-14. OCP stands for Older Camper Programs; includes Unicorps, W.A.L.L., and S.A.I.L. Unicorps This older camper program focuses on high school aged students participating in service learning and giving back to their community. K-Staff stands for Kitchen Staff. They are the seasonal paid/volunteer staff that prepares all the food up at camp. PD stands for Program Director. Usually in pairs, Program Directors manage and lead their respective programs of camp: Classic Camp, W.A.L.L., UniCorps, and S.A.I.L. Are we missing a Woodsey lingo? Let us know in the comments below! What about “wench”, and Upper Site/College Camp? Biffy Juice- The waste that seeps through the dirt when campers flush too much. Employer: University Religious Conference. Doesn’t seem to quite match, does it. A wench was someone assigned to campers/staff during chores or other things they didn’t know about (especially doing dish duty long ago). It was the wenches that taught us to swing the drying baskets that we used to try to flip in circles without the dishes flying out all over. Wenches often lead skits and taught camp songs during campfires. They were very experienced in camp and the ways of camp. I haven’t been to uni-camp in a long time, but from what I have heard over the years is that lower site/upper site no longer exist. Uni-camp is in a whole new place isn’t it? They no longer have the A-frames? New cabins have been built? Uni-camp, college camp were all terms for the same thing. 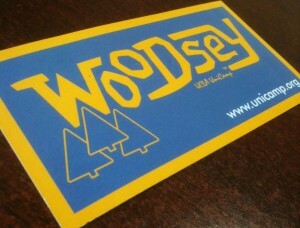 Uni-camp has always been sponsored and run by those that were from UCLA long ago. Now there are others who attend other colleges that step up to volunteer as staff too.